Vivo V15 Pro Geekbench Appearance Reveals Key Specs - Playfuldroid! The Vivo V15 Pro is scheduled to go official on Feb. 20. The pre-orders of the smartphone are expected begin on Feb. 15. Today, the smartphone has appeared on Geekbench with some important specifications. 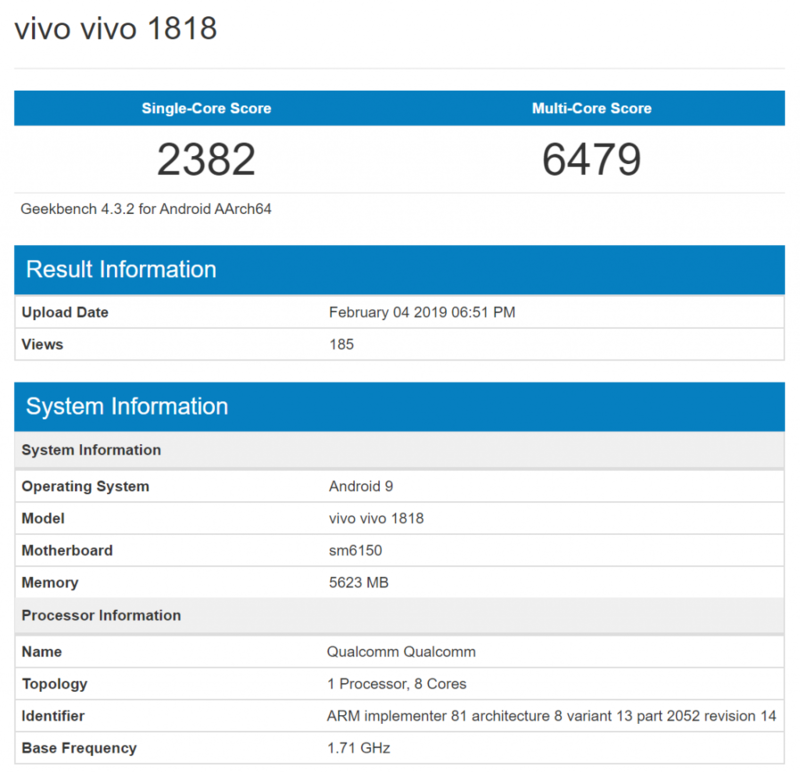 The Vivo V15 Pro has appeared with its model number Vivo 1818 on Geekbench. The smartphone is powered by sm6150 SoC. Previous reports have revealed that it is nothing but the Snapdragon 675 chipset. The SoC of the phone is supported by 6 GB of RAM. The smartphone is preloaded with the latest Android 9.0 Pie OS. In the single-core test, the Vivo 15 Pro has scored 2382 and it has recorded a score of 6479 in the multi-core test. Rumors have it that the Vivo V15 Pro will be arriving with a 6.5-inch Super AMOLED display that will be embedded with an in-display fingerprint scanner. After the discontinued Vivo NEX smartphone in India, the Vivo V15 Pro will be the next phone from the company to arrive with a pop-up selfie camera. Rumors have it that it will be featuring a 32-megapixel selfie camera. The rear side of the phone will be sporting a triple camera setup that will include a Samsung ISOCELL GM1 48-megapixel sensor, an 8-megapixel sensor and a 5-megapixel sensor. It is expected to release in color gradient choices of Blue and Red-Black.